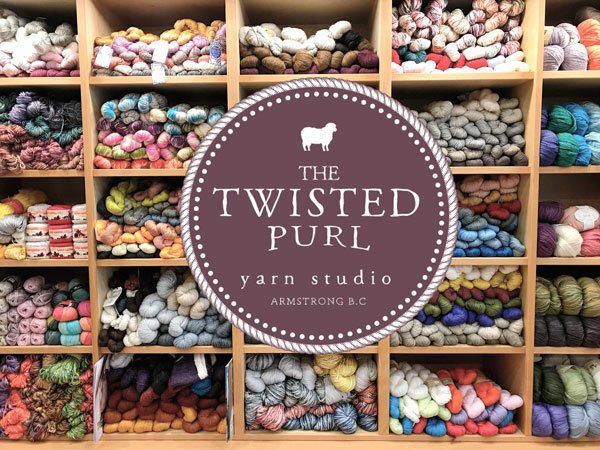 When we decided to create a Loyalty Program for our beloved Twisted Purl Customers, I realized how many point programs I participated in. For many years we have collected Air Miles, Avion Points, points at Expressions of Time (a bookstore in Vernon), points at Nature’s Fare, and for years Canadian Tire money was often discovered under car seats and in drawers. Then I realized that my plane ticket to Italy this Sunday was paid for with points. Collecting points while buying things we need and love, is a great way to enhance our lives. The Twisted Purl Yarn Studio Loyalty Program has begun. When you buy anything from our store you will be collecting points which will transform into redeemable dollars towards a future purchase. Our system keeps track of everything and all we will need is your name and email if you would like to be part of our community of creators. My sister Jane has been the person behind developing the new computer system and putting the Loyalty Program in place. Thank you Jane. Loyalty rewards will also be available to those shopping in our online store, which will be launching next month. Thank you to all of you who have come and spent time with us and bought yarn, needles, bags and other special things. Creating a thriving and successful business is about the relationship we have with our customers. We appreciate you.